One of the most satisfying parts of designing Specimen was coming up with the different attributes of the monster. Many players have told us that they thought building their monster was one of the most fun parts of playing. Constructing your monster is something that should be done carefully and with some forethought. There are twenty-five attributes to chose from. So what combination will produce a winning Specimen? Attributes cost 0, 1, 2, or 3 Attribute points. You have to take three attributes, but you can only spend three points. (yes, I know that if Attribute 25 Mutation is chosen, then that’s the only attribute you take – but in every other situation, you take three!) Usually, the more expensive the attribute, the more exotic or powerful it is. But don’t kid yourself; a 1, 1, 1 or 0, 0, 0 Specimen can go through a crew like swiss cheese just as well or better than a 3, 0, 0 Specimen. In fact, all of the Attributes will give your beastie an advantage in one way or another. The secret is recognizing those advantages and using them to their maximum potential. Since you normally have to take three Attributes, you will be usually pulling two cards from this group every game. Don’t dismiss them just because they only cost zero or one point. These Attributes can definitely swing the game in your favor. Another advantage to this group is that you can use these Attributes right at the start of the game (chosen Attributes aren’t available until the Specimen life cycle stage is equal to or greater than the Attribute point cost). 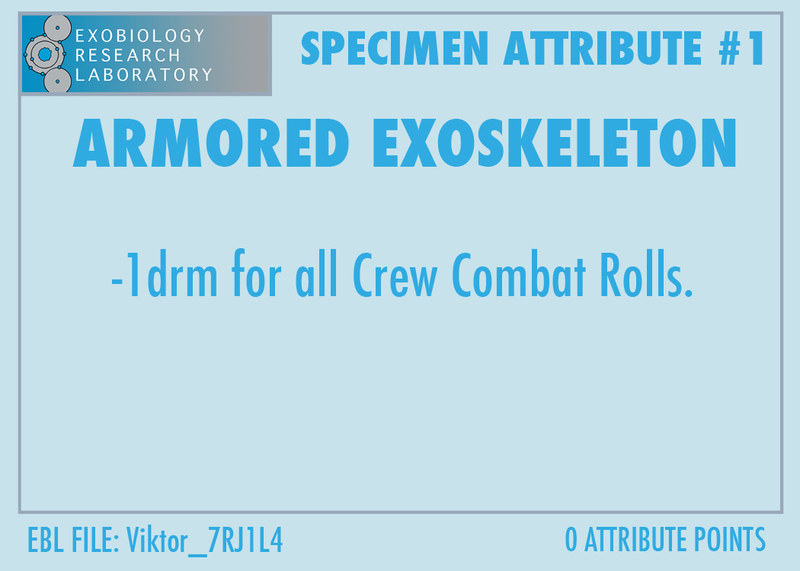 The first couple of Attributes like #1 Armored Exoskeleton and #4 Razor Sharp Talons give either a +drm to the Specimen combat roll, or a -drm to the Crew combat roll. Attribute #3 Chameleon Ability and #5 Polarized Carbon Cell Structure make the Specimen harder to detect. The next three, #6 Pheromone Emitter, #7 Hypnotic Gaze and #8 Sonic Screech all give the Specimen a special attack or defense, while #9 Goo Emitter allows the Specimen to leave goo in room sections, which can severely hamper Crew movement. All of these can help your beastie, and potentially leave a nasty surprise for the crew. You will only be choosing one Attribute from this group, but they’re all pretty good! 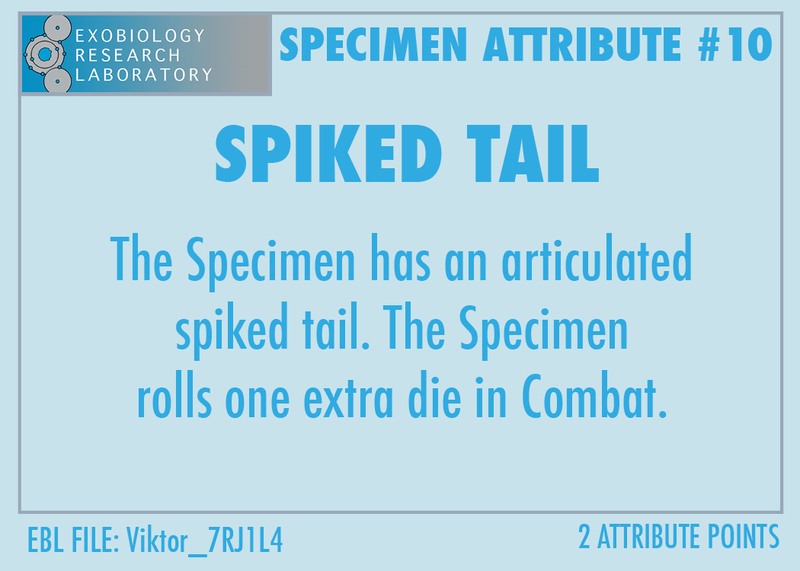 Just look at Attribute #10 Spiked Tail. This Attribute gives you an additional combat die – a very powerful Attribute. Many of our playtesters used this one to great advantage. The other eight all give some sort of special ability to the Specimen. You can build a Lair on the ship, (and get a +3drm in Combat there!) or be able to emit an EMP which will disable all of the ship’s electronics. You can be Harder to Kill and take an extra wound before being killed. There are Attributes in this group that will negate one specific crew weapon, or allow your Specimen to move through the airducts or emit toxic blood when wounded. Again, some very powerful abilities that can help you win the game. This last group is what we refer to as the ‘exotic’ Attributes. Attribute #21 Faster Evolution lets you evolve one turn faster than normal. 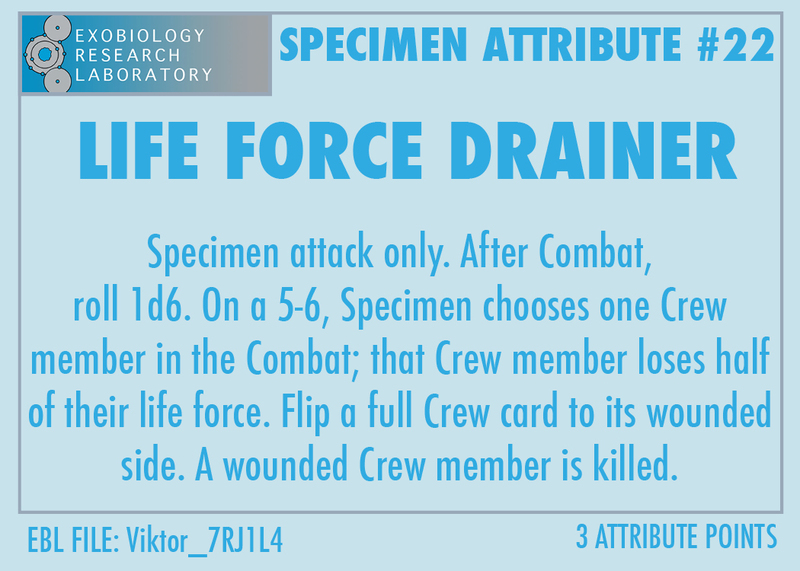 Attribute #22 Life Force Drainer gives you an extra roll in combat to drain the life force from a crew member (resulting in either wounding them or killing them!). #23 Embryo Implanter gives you the ability to create a whole new Specimen. We’ve had games that ended up with two beasties running amok on the ship! #24 Regeneration gives you the ability to heal wounds while #25 Mutation lets you draw a random attribute card in combat and see if it helps you. All of these are pretty powerful! With the exception of #21, which is available at the start of the game, these Attributes will not be available until your beastie reaches life cycle stage three. Now you just have to build your monster. Here’s where you have to make some decisions on how you’re going to play the game. If you take Armored Exoskeleton (0), Razor Sharp Talons (0), and Spiked Tail (2), you’ve built a lethal killing machine. Your goal should be to shred the crew. Once you’ve reached Level Two and gotten the extra combat die from Spiked Tail, you shouldn’t be afraid to wade into 2 or 3 crew members at a time. If you choose Thermal Vision (0), Chameleon Ability (0), and Walking EMP (2), your Specimen has been designed to operate in the dark. You would use your EMP to take out the lights and then stalk your prey as they bump around in the dark. Playing a Specimen with a three point Attribute (Except #21 Faster Evolution) will require some patience on your part. You’ll have to avoid any major combat in the early turns and concentrate on damaging the ship and possibly striking against solitary crew members. Once you reach Stage Three, then you can unleash your exotic Attribute on the unsuspecting crew. All the Attributes are fun. Some are harder to win with than others, but that’s the cool part. You get to play ‘mad scientist’ and try to build the perfect beast. Happy building!